Columbia Nashville duo Montgomery Gentry will be the 2010 recipient of the Academy of Country Music/The Home Depot Humanitarian Award, to be presented during the 45th Annual ACM Awards in Las Vegas on Sun., April 18, 2010. Eddie Montgomery and Troy Gentry are strong supporters of the U.S. military and numerous charitable organizations including the TJ Martell Foundation, Camp Horsin’ Around, and Make-A-Wish Foundation of Middle Tennessee. The duo also works with St. Jude’s Research Hospital, ACM’s Chairman’s Ride benefiting ACM Lifting Lives, USO Tours to the Persian Gulf, Hospice of the Bluegrass and Multiple Myeloma Foundation, David Dickens Melanoma Research Foundation, Leukemia & Lymphoma Society, and Patient Advocate Foundation. As recipients of the Humanitarian Award, Montgomery Gentry will receive a KaBOOM! playground built in their honor by The Home Depot and a beautiful crystal trophy designed by Tiffany & Co. during the live ACM telecast on CBS. Today the Academy of Country Music also announced events celebrating what has come to be called “The Week Vegas Goes Country®”— the week of the ACM Awards. ACM Concerts at Fremont Street Experience featuring headlining performances by Lady Antebellum on Friday and Miranda Lambert on Saturday. Free and open-to-the-public concerts start at 6:30pm on two stages in downtown Las Vegas. For the second year in a row, winners in each of the newcomer categories Top New Solo Vocalist, Top New Vocal Group and Top New Vocal Duo will have the chance to perform during these concerts. ACM Chairman’s Ride: An invitation-only event for artists and industry VIPs to experience a scenic motorcycle ride through the Nevada landscape. 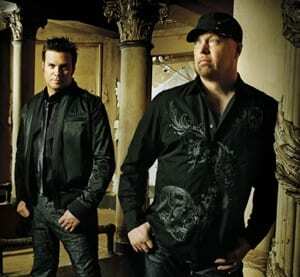 Montgomery Gentry will host the ride for the sixth time this year. The event benefits ACM Lifting Lives. USO Concert in Partnership with ACM Lifting Lives: For the first time ever, ACM Lifting Lives (the Academy’s charitable arm) is partnering with the USO to bring a free, private concert to the service men and women of Nellis Air Force Base just outside of Las Vegas, NV. USO tour veterans Montgomery Gentry and Randy Houser are scheduled to perform. 45th ANNUAL ACADEMY OF COUNTRY MUSIC AWARDS – Hosted by Reba McEntire for a record 12th time and featuring the hottest performances by today’s superstars of country, the Awards will once again take place at the MGM Grand Garden Arena in Las Vegas. ACM All-Star Jam – This no-holds-barred jam features impromptu performances from the artists who participate in the Awards. ACM Presents: Brooks & Dunn – The Last Rodeo: Kix Brooks and Ronnie Dunn of Brooks & Dunn, the best-selling duo in the history of country music, will receive the Academy’s Milestone Award in recognition of their 20-year, record-breaking career during this tribute concert special. They will be honored for holding the record for the most wins of any artist in the Academy’s history with 26 awards. Artists already scheduled to perform at the taping include superstars Kenny Chesney, Reba McEntire, Rascal Flatts, Carrie Underwood and Keith Urban. Tickets are still available for this show, which benefits ACM Lifting Lives and will air at a later date on CBS Television Network from the MGM Grand Garden Arena. For information on tickets visit Ticketmaster.com. NOTE: The Annual Academy of Country Music Celebrity Golf Classic is on a hiatus for 2010.